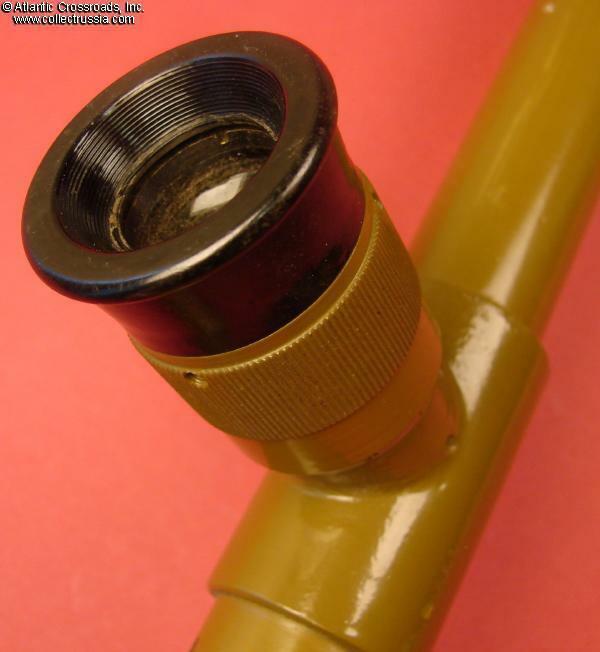 Trench Periscope (or "Scout Periscope") as used by forward observers and sniper teams to enable them to see without being seen, early to mid-1940s. 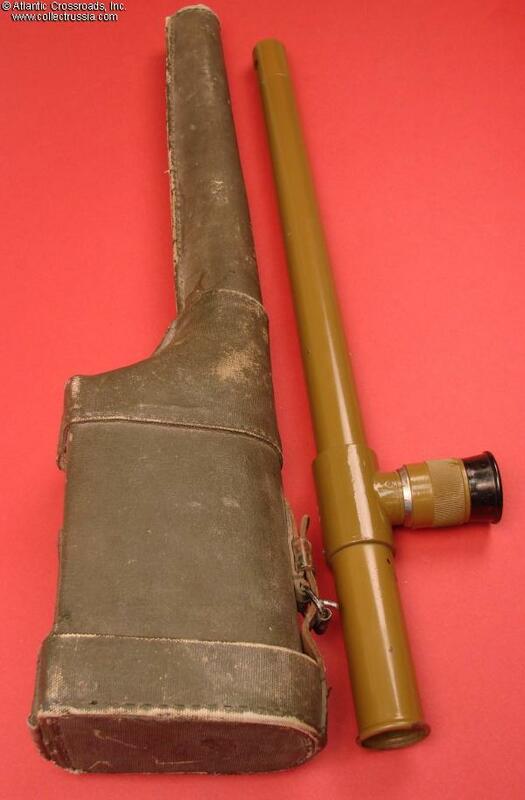 Trench Periscope (or "Scout Periscope") as used by forward observers and sniper teams to enable them to see without being seen, early to mid-1940s. 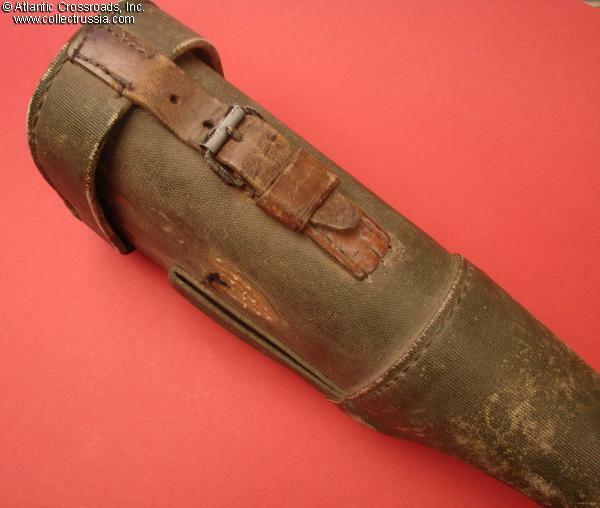 Undated model with early issue hard carrying case - probable arsenal rework of a wartime 'scope. Steel 22 ½" periscope with clear, fully functioning 4x optics with scale grid. 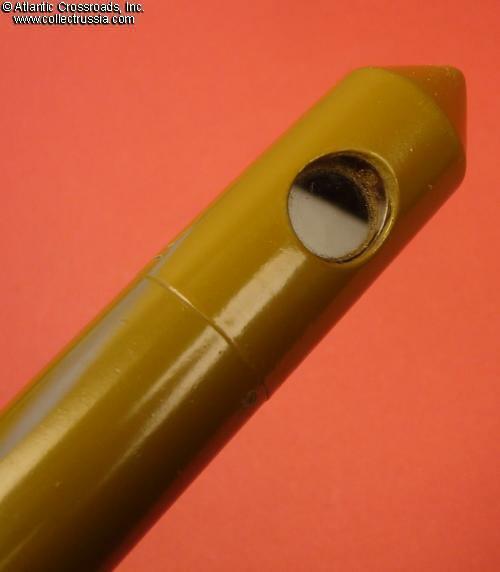 Olive green paint is virtually complete with only the tiniest of flecks missing. 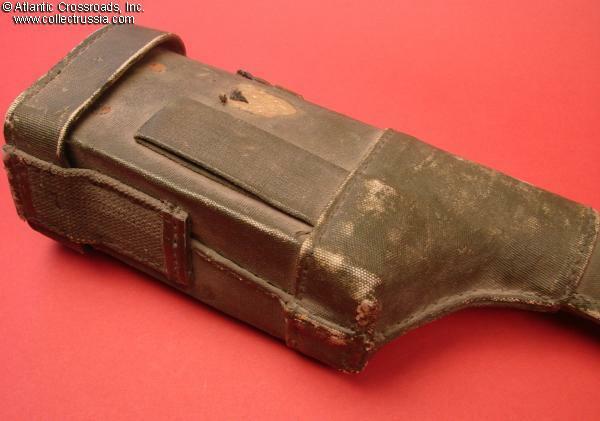 The carrying case is the early WW2 model - different than the more common soft model produced later in the war. The case is in hard rubberized canvas, with a leather buckled strap holding the top lid in place. It has one of the standard all over paint jobs that all such cases seem to have received at some point in their history. 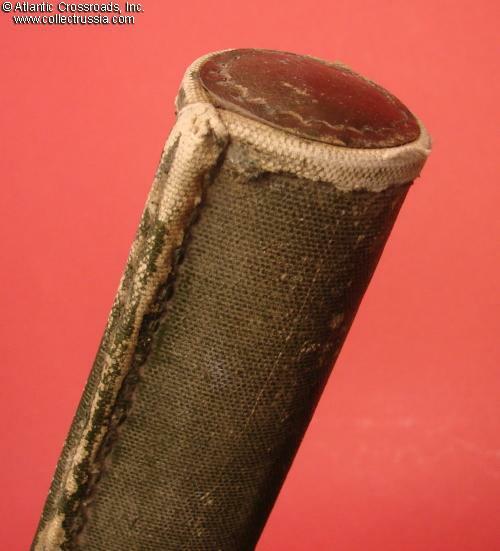 Canvas carrying strap has been lost to time (the traces where it was once attached to the case are still clearly visible), but the oversized canvas belt loop is still firmly attached. 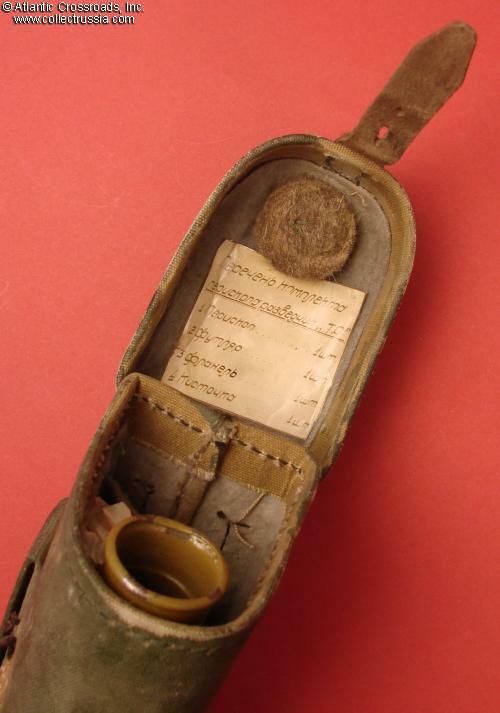 Inside the top lid is attached original manufacturer's inventory tag printed on photographic paper, listing the contents of the "scout periscope" kit: the periscope itself, the case, a flannel (which is included - still wrapped in its original parchment paper!) and a brush (which is now missing). 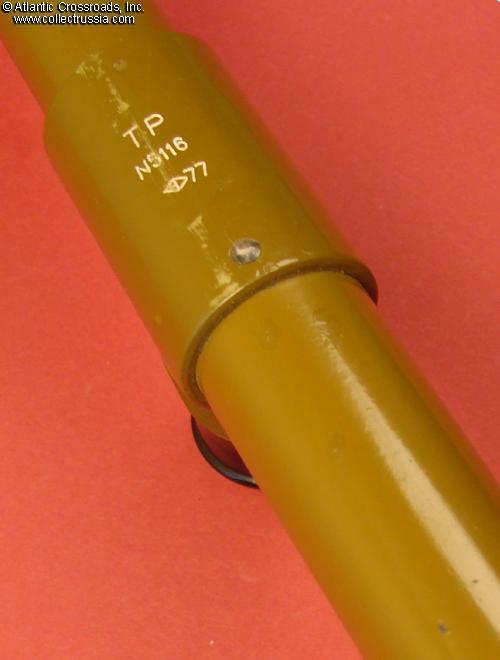 The serial number "5116" is stamped on the housing, next to the model designation, Cyrillic ТР ("TR"), which stands for Truba Razvedchika or "Reconnaissance Scout's Scope". The case shows wear to the canvas exterior but is still sound and will display nicely. 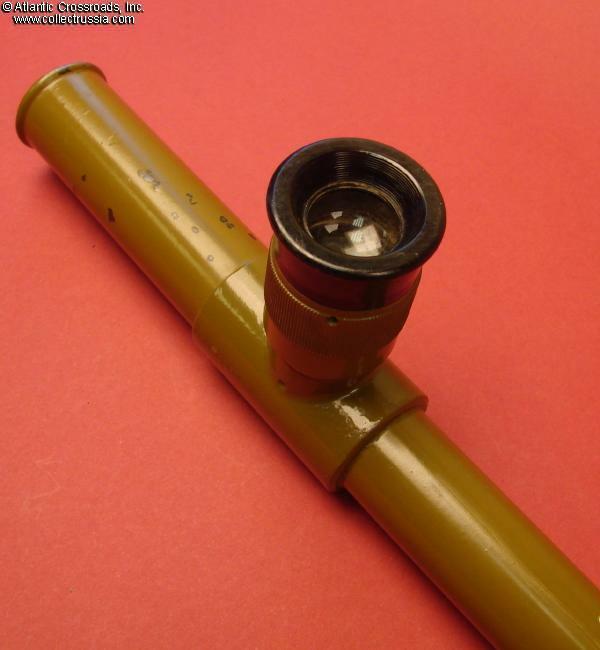 The scope itself is in excellent working condition. Sturdy steel construction meant that in a life or death situation, a Red Army soldier could have used this like a nightstick - although bashing a counterrevolutionary or a fascist invader over the head with it probably would have permanently ruined the optics! Outstanding piece of WW II field equipment.